Ella Rae Classic yarn is an evenly textured Worsted/DK weight 100% wool yarn that is soft and available in a full range of colors. This yarn is wonderful for sweaters, scarfs, hats, mittens, cable textured garments,colorwork or felting projects - this wool does it all! Ella Rae Classic comes in 220 yard (200 m) skeins and knits to a gauge of 20 sts per 4 inches on US #7 needles. Ella Raes Kasbah yarn is a lovely textured yarn that is made from 59% cotton and 49% acrylic. This yarn knits to a gauge of 18 st per 4 inches on US #7 needles. Each ball measures 66 yards (60 meters). Ella Rae Madison is a soft baby yarn made in Italy from wool wrapped with polyester puffs. Ella Rae Pebbly yarn is a boucle textured yarn that is a combination of 46% wool, 46% acrylic and 8% nylon. Each ball is 72 yards (66 m) and knits to a gauge of 3.25 sts per inch on a US #7-8 needle. Ella Rae Shibu Yarn is a gorgeous blend of 90% Silk and 10% Viscose. The Silk makes this yarn soft and wonderful and the viscose adds a speckle of sheen every half inch or so with a twist. Absolutely wonderful on the ball and done up in a project! Get some today! 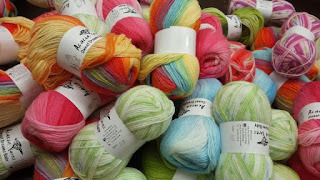 Shibu comes in 105 yard (95 m) balls and knits to a gauge of 20 sts per 4 inches on US #7 needles (4.5 mm). Ella Rae Silkience Yarn is made in Peru and consists of a blend of 41% Cotton, 39% Modal, 12% Silk, and 8% Rayon. Silkience is available in skeins that are 119 yards in length and Silkience yarn knits to a gauge of 5.5 sts per inch on a US#6 knitting needle. Each skein weighs 50 grams. This yarn knits with great drape and the modal and silk combination adds a lovely sheen to your garment.